For the past six months—other than research for my upcoming novel—I’ve almost exclusively read young adult lit: Tahereh Mafi, Michelle Hodkin, Sally Green, Rick Yancey, Marie Lu, John Green, Cassandra Clare, Jandy Nelson, Maggie Stiefvater, Julie Kagawa. I’ve revisited old favorites, sure, but other than purchasing the capstone book in a series I’ve followed for years, my library and bookstore acquisitions have been confined to YA. I broke my fast this past weekend with All the Missing Girls, by Megan Miranda—a YA author making her first foray into the world of adult fiction. Really, I couldn’t help it. The haunting, evocative cover snagged my eye, and before I knew it I was marching up to the counter with a hardcover in my hand. I know you’re not supposed to judge a book by its cover and all that—but in this case, I am so, so glad I did. 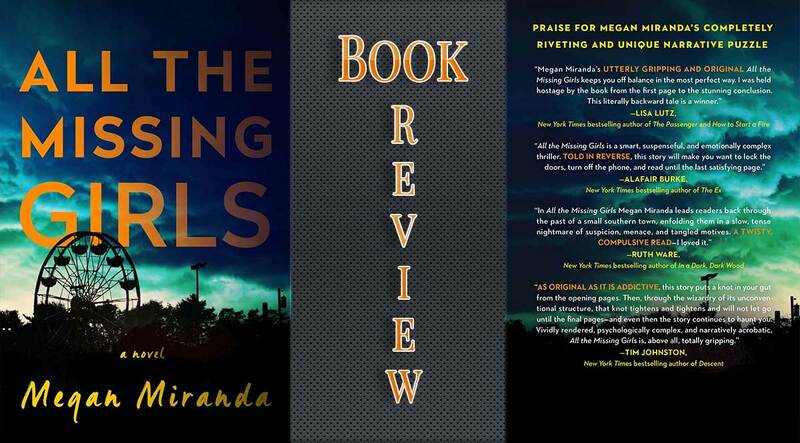 The first thing you need to know about All the Missing Girls is that it’s a thriller, with a tightly woven plot and a main character that is as charismatic as she is flawed. The second thing you need to know is that the story is told in reverse—starting at day 15 and winding its inexorable way backward to day 1—a narrative device that disorients the reader even as it intensifies the sense of mystery and urgency that pervades every page. This is the story of Nicolette Farrell, a woman who fled the small Southern town of Cooley Ridge ten years ago, after her best friend, Corinne, vanished for good. She’s got a good job in Philadelphia, a fiancé, and a whole new life—but when she has to go home to take care of her ailing father, the past rises up to swallow her all over again. Everyone who was a suspect in Corrine’s disappearance is still living in Cooley Ridge—Nic’s brother Daniel, her ex-boyfriend Tyler, and Corrine’s ex, Jackson. So is Annaleise Carter, the girl who served as their alibi on the night that Corinne went missing. But when Annaleise herself disappears, Nic is forced to confront everything she left behind on that long-ago night—and figure out the truth about what really happened in Cooley Ridge. Miranda’s writing is vivid, evoking a powerful sense of small-town claustrophobia and panic. The complex interpersonal relationships between her characters are well rendered, leaving the reader constantly off-balance, wondering how much weight to give a particular turn of phrase or an over-long look. No one in All The Missing Girls is blameless, with one potential exception. Everyone is implicated. No one escapes unscathed. I got to the end of the book and promptly wanted to read it again—but backward this time, from day 1 to day 15, understanding everything in reverse—looking for clues, figuring out what I’d missed or misinterpreted the first time around. All the Missing Girls is a suspenseful, deftly crafted, adrenaline-inducing page turner of a novel. Read this one with the lights on. Live in North Carolina? 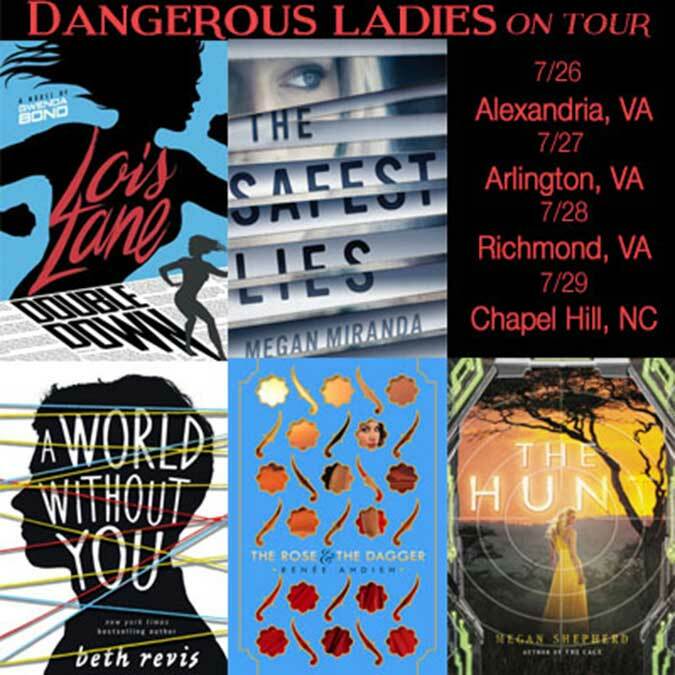 Megan Miranda will be joining fellow YA authors Beth Revis, Gwenda Bond, and Megan Shepherd on July 29th at Chapel Hill’s Flyleaf Books to chat about their latest releases, as part of the Dangerous Ladies 2.0 Tour. (In Megan Miranda’s case, that means she’ll be talking about her May 2016 YA release, The Safest Lies, rather than All The Missing Girls—which means that my TBR pile just got a little bit bigger.) Don’t miss this fantastic panel and book signing!